White or Grey beads with little brown legs, about the size of a pea. They attach their heads to the Hedgehog's skin. They can be find around the face, often behind the ears. They can also be found around the tail and skirt. But they may also be found anywhere else on the Hedgehog. 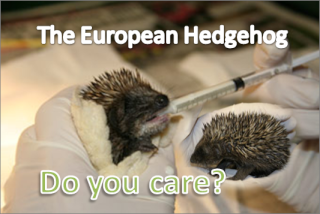 A Hedgehog with more than 12 Ticks will get Anaemia, which will severely weaken a it. A Hedgehog with more than 30 Ticks has a very poor chance of surviving. - Use Frontline™ Flea spray from the Vets. But be careful! Never spray it onto the Hedgehog! It is safe to be used on Hedgehogs, but it can cause severe breathing problems when breathed in or absorbed through the skin. This can kill a Hedgehog! - The safest way to use it is to spray it into a medicine cup about ½ ml to 1 ml. - Then you can use a cotton wool bud to wipe a tiny bit of the spray onto the Tick. This will ensure that none of the Frontline will get onto the Hedgehog. - Another way to get the Ticks off is to use a pair of Tweezers. Grip the Tick firmly with them and twist Anti-clockwise 3 or 4 times. -Do Not pull! If you do the head of the Tick will be left behind and will cause an infection. Just gently turn and the Tick should fall out. - This way takes time, and you should only do so if you are sure you know what you are doing. - You can also buy a special Tick remover like this one. It is called Trix Tick Remover and is not too expensive. Please do not use with hot water. You can also put a drop of oil (olive, vegetable etc) on the tick, this will cause it to lose grip and fall off after a while.